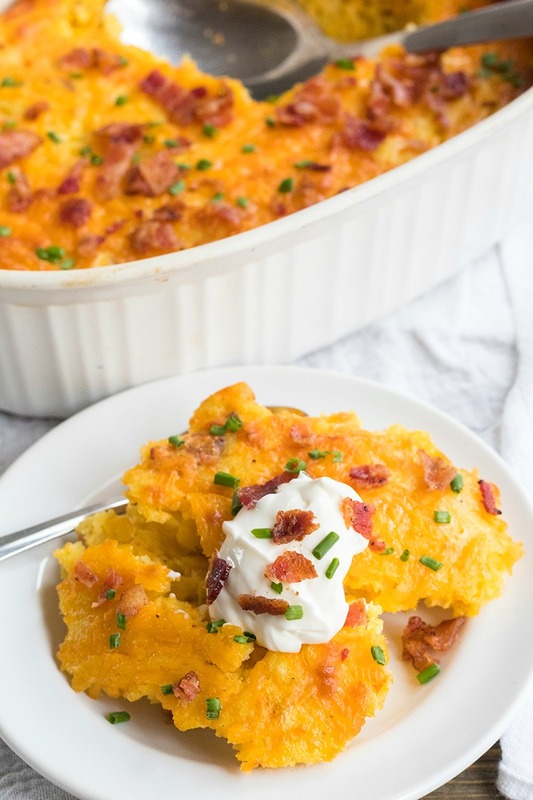 Cheesy Bacon Spoon Bread Recipe is a comforting side dish that’s easy to make and goes great with practically any meal! My favorite childhood memories are built around food, and one of my favorites was when we would have Sunday Supper at my grandma’s house. She would make fried chicken, white cornbread, greens, mashed potatoes, and banana pudding for dessert. 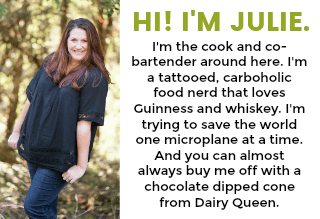 These Southern food traditions have stayed with me since then. While I didn’t get a chance to learn all of Grandma’s kitchen secrets before she passed, I carry her in the kitchen with me every day. 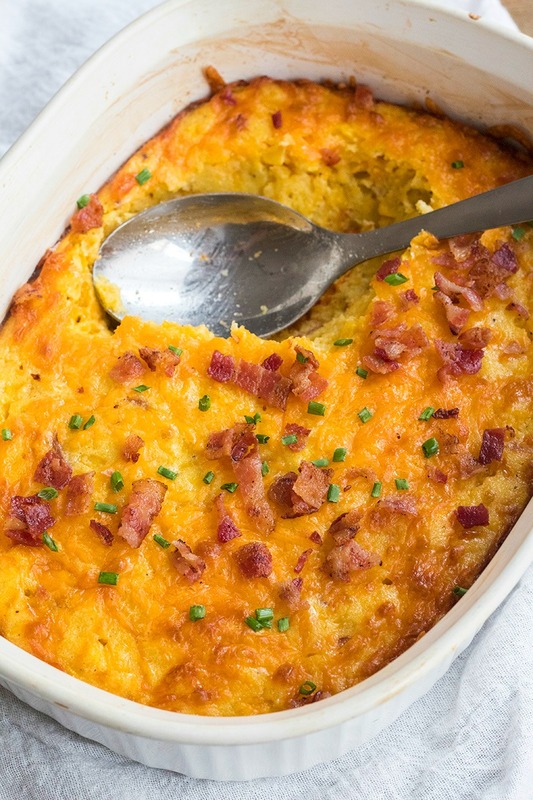 This Cheesy Bacon Spoon Bread Recipe is my ode to her Southern cooking and my favorite cornbread. Since this recipe is so simple, starting with quality ingredients is a must. 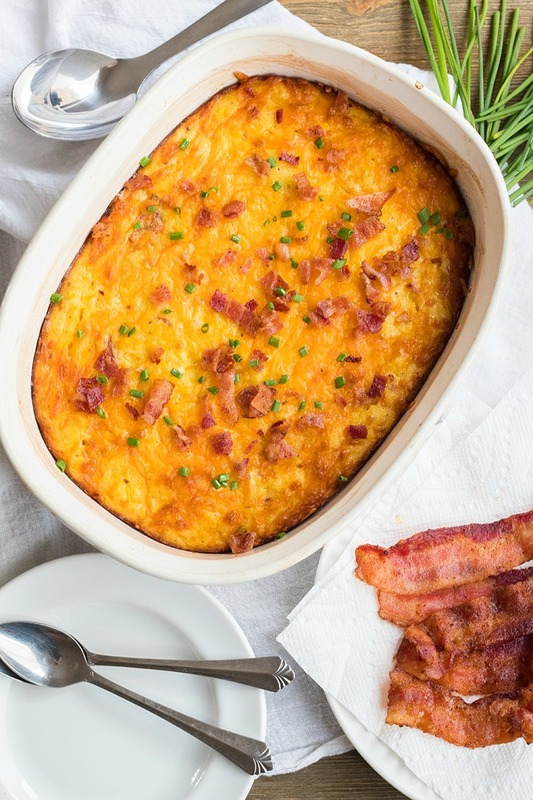 Bacon freaks know good bacon can make or break your dish, so it was no contest for me to grab some Oscar Mayer bacon for this spoon bread recipe. I like the center cut bacon for its meat to fat ratio, but Oscar Mayer thick cut bacon would also work great for this recipe. It crisps up beautifully and tastes SO good. I may have cooked up the entire package so I could make sure there was some bacon left to mix into the spoon bread. My husband is notorious for working his way into the kitchen to snag a strip of bacon while my back is turned. Not that I can blame him. This Oscar Mayer Bacon is goooo-ooood!! Mike kept commenting on how much he liked the Oscar Mayer bacon, and he never does that. So what the heck is spoon bread? It’s kind of like a corn pudding recipe, but not. Spoonbread is a cornmeal-based dish that may or may not include corn kernels. 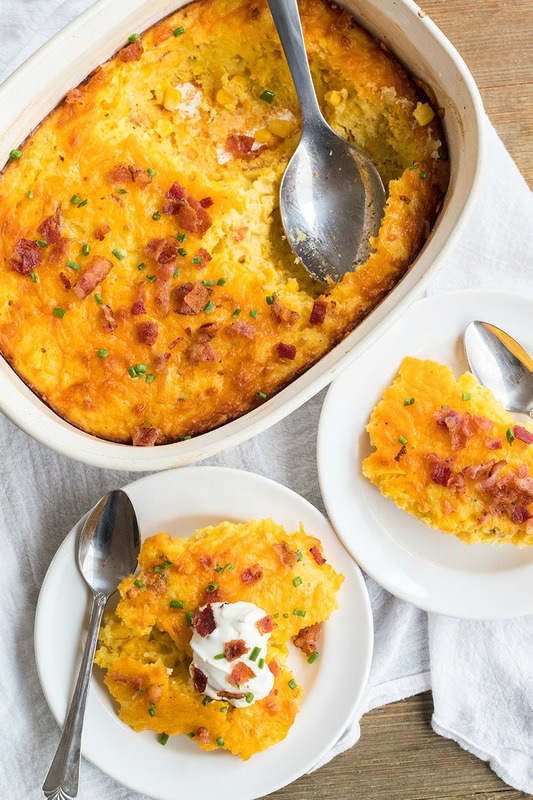 While corn pudding recipes usually have a more custard-like consistency and tend to be sweet (like sweet cornbread tasting), spoon bread recipes are denser – in between corn bread and corn pudding – and are savory. I especially love serving spoon bread at Easter and Christmas when we’re serving up a Brown Sugar Bourbon Ham. It balances out the sweet pork flavor and goes great with all your favorite sides. Cook cornmeal and milk with seasonings until thickened. 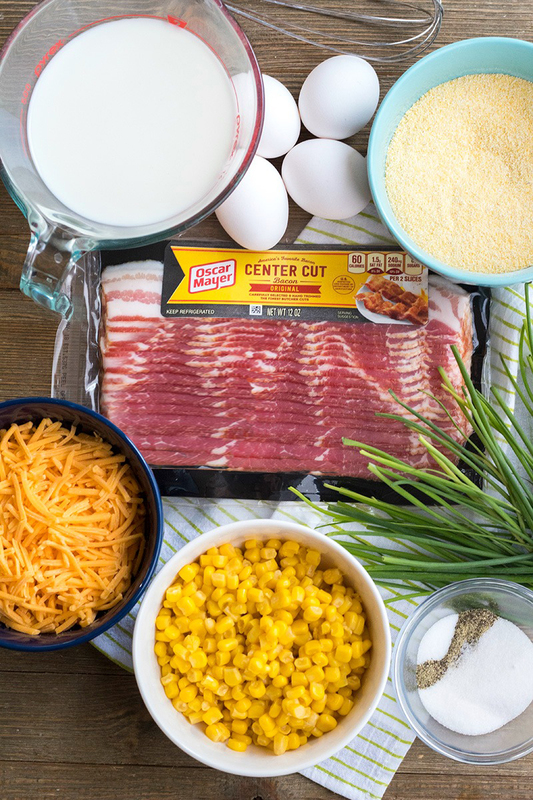 Add eggs, oil, and any other add-ins – like Oscar Mayer Bacon, cheese, corn kernels, jalapenos, cayenne, roasted garlic, etc. Pour into a casserole dish and bake until golden and puffy. There are also a few preparation variations you can try too. Use store-bought cornbread mix to make Jiffy spoon bread recipe. The spoon bread will have a slightly more tender crumb. You can also separate the eggs, mix the yolks into the cornmeal batter, whip the whites, and fold the whites into the batter. This gives an airy spoon bread recipe and makes it a bit more like a souffle. Southern recipes traditionally don’t whip the egg whites though. I like to keep things pretty basic and still to the original format for this dish. 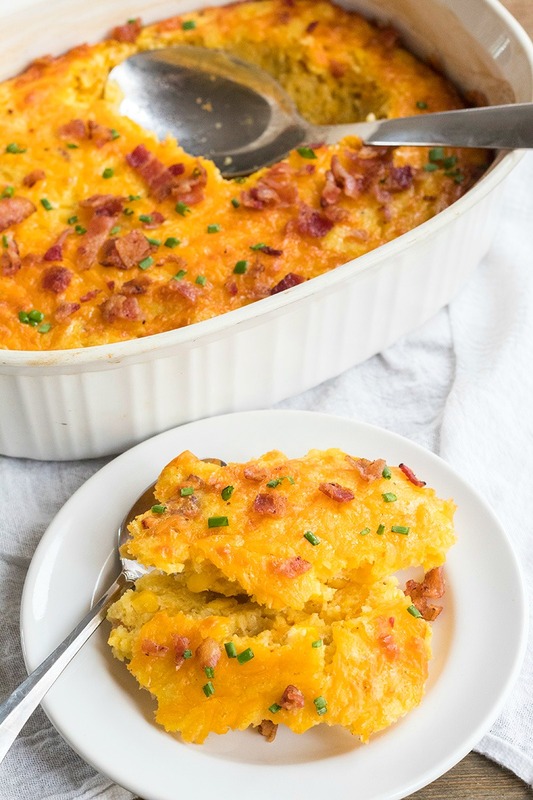 Cheesy Bacon Spoon Bread Recipecipe is a comforting side dish that's super easy to make and goes great with practically any meal! Preheat oven to 375 degrees F. Coat a 2-quart casserole dish with butter. Set aside. Place bacon in an unheated skillet. Cook bacon on medium heat for 8 to 10 minutes, turning frequently. Once crispy, remove bacon to a paper towel-lined plate to drain. After bacon has cooled enough to handle, roughly chop. Place a medium saucepan over medium-high heat. To the saucepan add the milk, cornmeal, sugar, salt, and pepper & stir until smooth. Cook mixture, stirring often until thickened and bubbling, about 5 minutes. Remove from heat. Transfer cornmeal mixture to a mixing bowl. Stir in the eggs and oil. Stir in 3/4 of the bacon (reserving some for garnish), corn kernels, and 1 cup of cheese. Pour the batter into your prepared dish. Sprinkle the top with remaining 1/2 cup cheese. Bake for 35 to 40 minutes, or until puffed and browned around the edges. (A knife inserted into the center should come out clean with moist crumbs attached.) Carefully remove from the oven and let cool for at least 5 minutes before serving. Garnish the top of the spoon bread with reserved bacon and chives. Serve with a dollop of sour cream if desired.